Many times people have dream of staying in a huge royal palace on the seashore,on the banks of a river or at least a place facing the water reservoir. 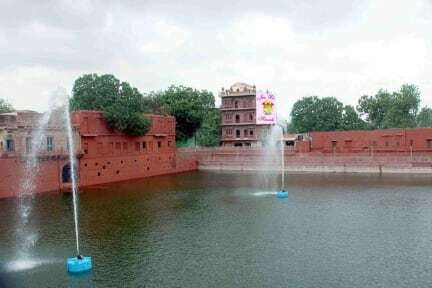 There is such a place in JODHPUR. The 19th Century sandstone place built on a hillock facing GULAB SAGAR Lake is one of such places that is definitely going to win your heart. The rooms have very finely carved latticed windows that allow the soft, cool breeze to blow into the interiors of the place. The embankments of the lake in front of the hotel have a domed structure that offers a fabulous view of the lake encircled by hills and an artificial cascading waterfall. 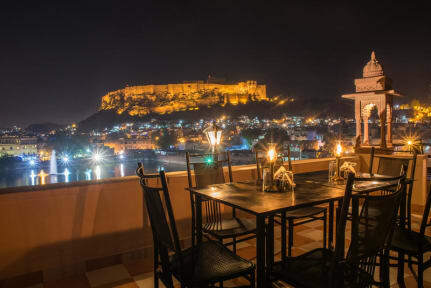 Located in central Jodhpur, it nevertheless enjoys the calmness away from the city crowd. The rooms and suites create an ambiance that make you feel as if you are staying in a royal palace. You can even a walk through the bridge and see black diamond fish and ducks on the lake.